On March 22, 2019, EPA made 24 full study reports on PV29 available to the public, in some instances with information withheld as confidential business information (CBI) pursuant to EPA regulations. EPA has considered these materials in the risk evaluation process of PV29 and has also submitted these materials to the TSCA Science Advisory Committee on Chemicals (SACC). EPA states that comments submitted will be considered by the agency and also provided to the TSCA SACC peer review panel, which will have the opportunity to consider the comments during its discussions. By Lynn L. Bergeson, Richard E. Engler, Ph.D., and Margaret R. Graham, M.S. On February 20, 2019, during a cold, snow-filled winter day, the rugged staff of Bergeson & Campbell, P.C. (B&C®) as well as several hearty senior U.S. Environmental Protection Agency (EPA) officials got together over some steaming cups of coffee and discussed the upcoming fate of the Toxic Substances Control Act (TSCA) during a Bloomberg-hosted, B&C-developed webinar: Chemical Policy Summit Series Part V: Chemical Regulation After the Mid-Terms: What We Can Expect to See in 2019. In attendance were: The Honorable Alexandra Dapolito Dunn, the newly appointed Assistant Administrator of EPA’s Office of Chemical Safety and Pollution Prevention (OCSPP); Jeffery T. Morris, Ph.D., Director, Office of Pollution Prevention and Toxics (OPPT); Rick P. Keigwin, Jr., Director of the Office of Pesticide Programs (OPP); Beau Greenwood, Executive Vice President, Government Affairs, CropLife America; Lynn L. Bergeson, Managing Partner of B&C; and James V. Aidala, Senior Government Affairs Consultant, B&C. Ms. Dunn, Dr. Morris, and Mr. Keigwin described their priorities in the webinar. 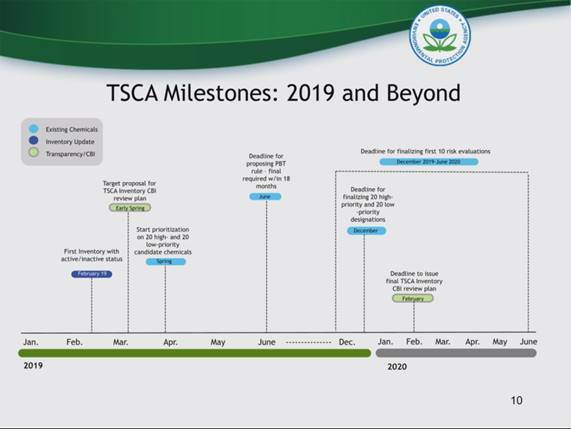 Ms. Dunn stated 2019 “is going to be one of those buckle-your-seat-belt kind of years” in relation to getting everything done as required under TSCA. Some of the takeaways from that webinar are listed below. EPA will be proposing its rule to regulate five persistent, bioaccumulative, and toxic chemicals by June 2019; EPA will be using a different approach than what is typically used for risk assessments. EPA has pledged to make all PMNs, all health and safety studies, attachments, amendments and other associated information available in public dockets. B&C’s other upcoming seminars and webinars are available here. Some other resources of interest are B&C’s newly minted TSCA Tutor™ Modular Training Program which provides live in-person training at a company’s site, live online training, and pre-recorded webinar training modules -- all designed to offer expert, efficient, and essential TSCA training; as well as B&C’s All Things Chemical™ Podcasts, which provide intelligent, insightful conversation about everything related to industrial, pesticidal, and specialty chemicals and the law and business issues surrounding chemicals. On December 31, 2018, the U.S. Environmental Protection Agency (EPA), even though they had already shut down due to funding issues, announced that if the government shutdown continues through 5:00 p.m. (EST) January 4, 2019, the Toxic Substances Control Act (TSCA) Science Advisory Committee on Chemicals’ (SACC) January 8, 2019, Preparatory Virtual Meeting for the January 29 through February 1, 2019, meeting on Colour Index (C.I.) Pigment Violet 29 will be cancelled, and discussion of charge questions will be folded into the face-to-face meeting scheduled for January 29 through February 1, 2019. Further, if the shutdown continues through 5:00 p.m. (EST) January 11, 2019, the TSCA SACC’s January 29 through February 1, 2019, Peer Review of the draft risk evaluation for C.I. Pigment Violet 29 will be postponed. More information on the draft risk evaluation of C.I. Pigment Violet 29 is available in our memorandum EPA Publishes First Draft TSCA Chemical Risk Evaluation. The disruptive effects to EPA could be considerable if these regulations were vacated while EPA completes its remand process; if the provisions are vacated, manufacturers could (intentionally or unintentionally) submit junk science or irrelevant material, requiring EPA to consume limited resources and take time out of the statutorily-mandated schedule to review the information. Further, vacatur of the Relevancy Provision would be particularly disruptive because it would eliminate altogether the affirmative requirement for manufacturers to submit lists of information when requesting risk evaluations; and could delay EPA’s information gathering if it had to request or order such information from the outset. More information on the appeals to the TSCA framework rule on risk evaluation is available on our blog.